Classical software engineers work in organized and structured ways, for the pursuit of perfect code. Give them a specification of what you want, and they will deliver on time, to cost, and with zero defects. Their work process is down to a science. Quality, on time, within costs is their mantra. EDS, IBM, and NASA are some of the bastions of this scientific process. They have achieved the top level of the computer science game, as measured by the CMM organization and the prestigious Software Engineering Institute. Hackers, on the other hand, pursue the beautiful solution. As with other artistic media, a beautiful solution is impossible to explain, but you recognize it when you see it. Larry Page's original Back Rub algorithm, which powers Google, is a beautiful solution. Job's and Wozniak's first Apple prototype computer was a beautiful solution. Beautiful solutions are so astounding that they need not be perfect; imperfections add to their charm. The code will not be finished on time, it will cost more and will be full of errors, but you will be impressed. It will be novel, it will enlighten, and it will make an important contribution; beautiful solutions make a difference. Web companies, like Google, are hiring both. Software engineers to polish and maintain established services. Hackers to create services from nothing. To try and stay ahead of the game, Google is hiring candidates that can innovate; hackers to artfully create new astounding services. To maintain and polish its existing software, Google is also hiring software engineers to implement process and quality. The novelty is that Google likes the 2 in 1 solution; hacker and computer scientist in one. By Google's own admission, all their employees have to be 30% hacker and 70% scientist. Hispavista, my company's spanish arm, has 70 technical staff. Also a mix of hackers and software engineers. But unlike Google, they work in separate teams. Following Steve Job's famous example at Apple's skunkworks, our hacker and scientists work in separate departments. Our development department has achieved CMM level 2, and could easily certify as ISO9001 compliant. Our head of development produces the best quality and lowest costing function points in Europe; he has among best software engineering teams in Europe. Our innovation department produces beautiful solutions. Dating back to 1995 our Strategy Director has created web services that have amassed millions of internet subscribers; he is a hacker of some reknown whose works have been sold for tens of millions (literally). The problem is that their process and culture are totally different. Software engineers aim for zero errors and zero delays, hackers aim to be world famous. The hard part is getting good hacking and coding at the same time. One can’t live with out the other, yet are totally different in approach. Our experience at Hispavista is that they are best roomed on opposite sides of the building, and project hand overs require a good referee. Google, on the other hand, has opted for the borg approach, part human part machine. Googlers engineer sofware for 70% of the time, and hack 30% of the time. Eric Schmidt has repeatedly described how hacking project's that do well online become bona-fida software engineering projects. The successful hacker is given a team of people to manage, code to review, and quality to assure. The question for the hacker is whether to continue as software engineering manager or hand over to somebody else so as to get more hacking time. Ed Yourdon, one of the inventors of software engineering, visiting digg.com visiting Google observes that web2.0 startups will need software engineers as the service grows. Hackers will not be out of work though. Software engineering may be outsourced, but entrepreneur and intrapreneuship has become the essence of competitive edge and is core to a business. Innovation has become the new marketing. Judging by the way Google is recruiting among the web2.0 hacking community, hackers are here to stay. There is a strong cultural divide between between hacker community, and structured development professionals. The divide is best described by Eric Raymond’s “The Cathedral & the Bazaar” essay, and his O’Reilly book. Paul Graham's O'Reilly book is also a good reference. Structured, designed development on the one hand and distributed development on the other. Some call the bazaar Linux-style development. Integrating both styles is becoming a real problem for business. Open sourcing code to the hacker community is becoming widespread, for both marketing and development motives. Some companies like MySQL (open source database) feed of the external development as an idea & innovation base, and use only internal code for their releases. Others use external, unstructured development, for their code base. My post is written for the hacker community and as such contains cultural assumptions, and is naturally not exact. I keep the post lenghts down, and use artistic license so the story does not bore the visitors. So Newton invented gravity, Ford the motorcar, Einstein the atom bomb, and you invented structured development. It is hard to be interesting and entertaining in 500 words. The point behind my story is how you integrate both contributions. To my knowledge the problem has not been addressed as yet, and most of us find an arrangement by trial and error. Yet the challenge is more and more widespread among businesses. A subject of a book perhaps. web2.0 startups will need software engineers as the service grows. Google and other "enlightened" companies recognise that good engineers are not happy just doing "Software Engineering" (development) or "Hacking" (innovation/research), and thrive in an environment in which there is a continuous alternation between the two activities. Keeping innovation activities limited to a part of the developers effectively prevents other teams from contributing to the success of the innovation process. This is where Google's 80/20 rule helps, as all engineers have time available for innovation as well as their "development" work. So, to answer your title question, I would say Google is hiring Computer Scientists, people who will both push the innovation as well as deliver cost-effective software. 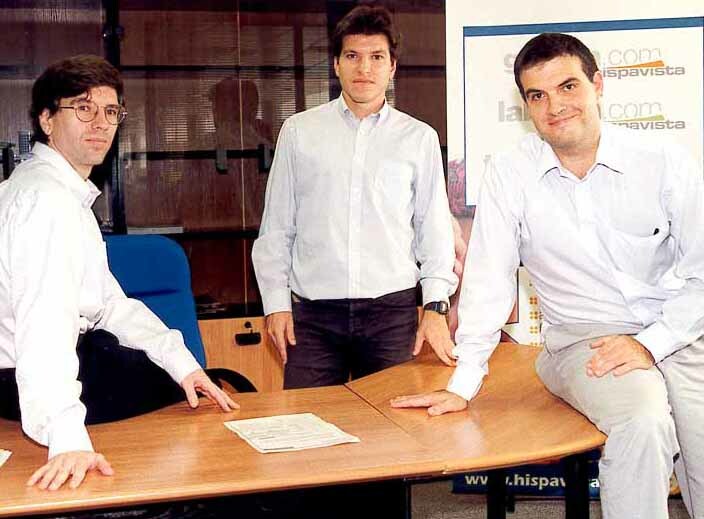 PS: I worked at Hispavista once years ago, and I'm about to start at Google, hope things are going well in Donosti. good to hear from you. Congratulations on your Google appointment. Fabulous opportunity. Your work at Hispavista has not being forgotten. The systems department still uses the file transfer process you designed. That was a job well done. Point taken about hackers or computer scientists. It is always better if everybody joins in on the fun. Good for morale, good for productivity, plus the brainstorm and the creative ideas are more effective. But we both know the realities of the average company require more division of labour. It is only when you are in an exceptional market position, like Google's, where such a luxury is possible. It is odd but the term computer scientists is not popular among some of the open source community. Notably among the Raymond, Stallman and specially Paul Graham followers. See Paul Graham's OReilly book Hackers & Painters. Hispavista is still one the biggest internet outfits in Spain. With over a 100 staff, we are bigger than Yahoo and Google's spanish team together. And yet we only make a fraction of Google's R&D investment. You should come and visit us again when you come home. Best of luck at Google.